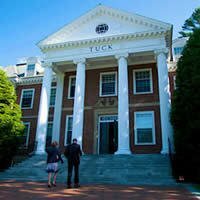 Dartmouth Tuck MBA Application Deadlines 2016-2017 have been released by Dartmouth Tuck School of Business for the upcoming MBA admissions year. Early Action Round – October 5th, 2016 is when the MBA application and Letters of Recommendation are due. October 31, 2016 is when the applicant-initiated interview must be complete. The notification date of the admissions decision will be on December 16th, 2016. The $4,500 deposit is due by January 13th, 2017. Round 2 – November 2nd, 2016 is when the MBA application and Letters of Recommendation are due. November 11th, 2016 is when the applicant-initiated interview must be complete. The notification date of the admissions decision will be on February 10th, 2017. The $2,500 deposit is due by April 28th, 2017. Round 3 – January 4th, 2017 is when the MBA application and Letters of Recommendation are due. January 31st, 2017 is when the applicant-initiated interview must be complete. The notification date of the admissions decision will be on March 10th, 2017. The $2,500 deposit is due by April 28th, 2017. Round 4 – April 5th, 2017 is when the MBA application and Letters of Recommendation are due. April 3rd, 2017 is when the applicant-initiated interview must be complete. The notification date of the admissions decision will be on May 13th, 2017. The $2,500 deposit is due by June 2nd, 2017. Dartmouth Tuck School of Business is a member school of the Consortium and has set tentative dates that are the same as the Consortium application dates from last year. Visit Dartmouth Tuck Application Process and the Important Dates page to learn more information about applying to the MBA program and the business school.